Licia was inspired to make these hearts after seeing natural, cane-wrapped stars in the shops at Christmas. They look like fun and are easy to do. 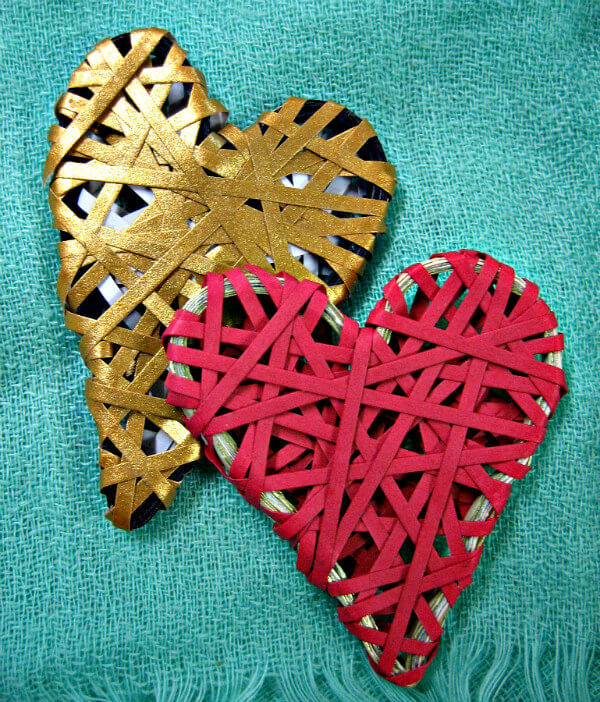 Make them as Valentine's Day decorations or as a crafty activity at a birthday party. Metallic paper adds a bit of glam. Young girls can add a jump ring and chain to wear as a necklace. You could also glue one on a card along with the sentiment Wrapped in your love... or I'm so wrapped up in you! a. Roll a paper strip around a glue bottle, jar, or whatever object is on hand that is roughly the diameter you would like your heart to be. There's no need to glue as you roll, as long as the paper is held firmly. When the strip end is reached, glue it in place. b. Glue one end of a second strip immediately next to where the first one ended. The two ends should meet, butting up against one another. Continue adding strips to the ring coil until it is sturdy and about 1/8 inch thick. Slip the coil off the form. a. Apply a dot of quick-drying glue on the end of a strip and press it to the back of the coil. Wrap the strip around the heart until a good stopping place is reached on the back. Glue it in place and trim excess paper. b. 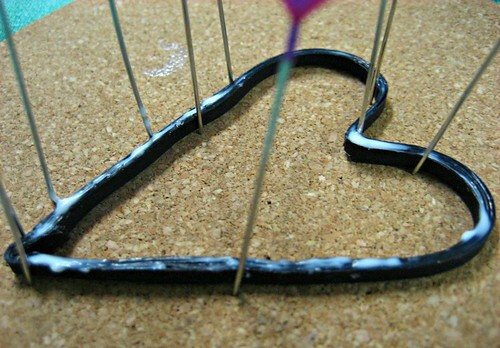 Glue the next strip on the back of the heart ring anywhere you like and continue wrapping. 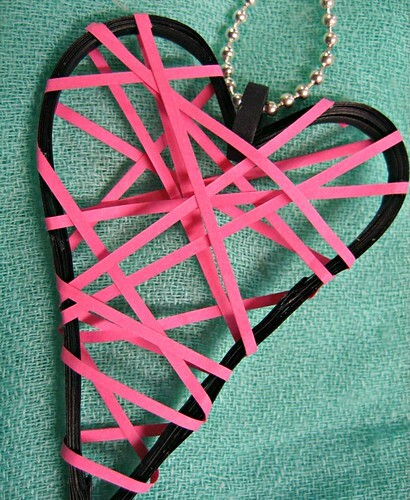 As more strips fill in the heart, glue the strips where they happen to end, overlapping another strip slightly. Make sure the strips are always joined on the back of the heart for a tidy look. 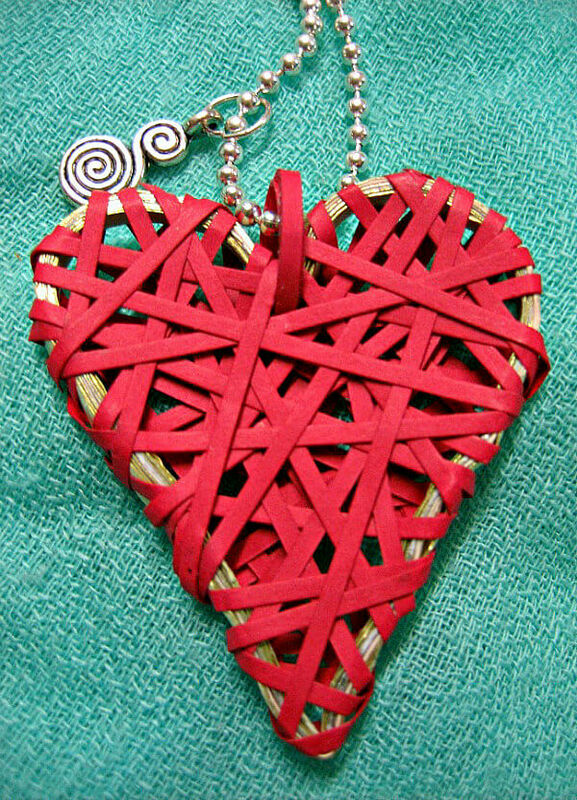 Make a small ring coil by wrapping a paper strip around the indentation of the heart. Check to be sure the opening is large enough for the chain to slide through. Glue the end in place. Here Licia has added an extra charm to the chain - cute! Here's another Valentine project from Licia! very nice, thanks for sharing!!! Very pretty!!!. Looks easy too . Sure will give it a try. The ring coil is quilling paper, but you can cut your own strips if you prefer. Thanks for the link to your cute star ornament. Gotta give this a try! Very unique! Fun project! I had the same question about the 'ring coil'...which looks like metal in the photos. What is very interesting is that the framing is paper strips also. I initially thought it was wire. Its a great idea for using recycled papers too...gift wrap, magazines, junk mail... All kinds. Thank you so much...its really pretty and a wonderful project. Have been looking for some information about quilling, never tried it before and would really like to. This looks like a great place to start. Thanks so much, looking forward to making this and other paper crafts. I'm happy to hear that, Phanti. Yes, there are lots of quilling tutorial links at the top of the page. Have fun with paper rolling.